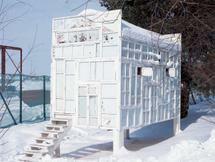 The Pavilion for Vodka Ceremonies is a structure and performative ceremony designed by Alexander Brodsky for the ArtKlyazma art festival in 2003. Similar to Ice House and 95 Degrees Restaurant, the pavilion is located on the popular Muscovite retreat, Klyazma Reservoir. The area around the former river harbour lies in the southern part of Buda. The territory was abandoned and heavily polluted industrial site, partially used for personal holiday purposes in the last decades of the Communist regime and in the ‘90s. In 2005 a competition was organized for the.. 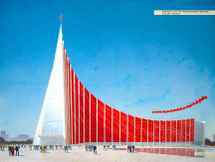 The Soviet pavilion, designed for the Osaka World Expo which was held from March 15th to September 13th in 1970, was a sweeping red and white building. It was the tallest at the fair and contained the usual industrial and technical displays, a piano that once belonged to the composer Tchaikovsky,.. The first construction in the northern part of the USSR EPEA architectural ensemble, which was intended by designers for major buildings, appeared in 1967. This construction is still called a "Montreal" one because it was carried from Expo 67 World Exhibition in Montreal. 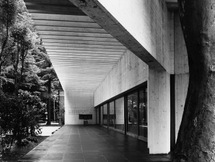 The nordic pavilion on the Biennale campus in Venice resulted from a competition in 1958 and was official opened in 1962. The roof consists of concrete beams one metre high in two direction: each beam is 6 cm thick and together they form a 2-metre high brise soleil. Transparent roof elements are.. 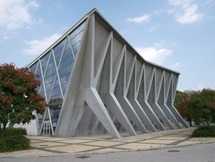 The history of the Zagreb trade fair is closely bound up with the development of the city of Zagreb. 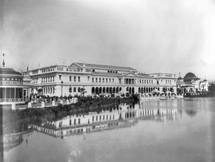 Over the last hundred years, the trade fair changed address no less than five times. From Ban Jelačić Square, today the most important public plaza in Zagreb, via a location at Martićeva Street,..
Sandworm is an organic structure/space/creature realized on the dunes of the Wenduine coastline, Belgium. 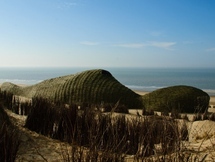 The 45 meters long and 10 m wide and high installation moves freely in-between architecture and environmental art and is constructed entirely out of willow following the local knowledge of a.. 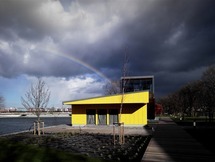 Opened to the public since July 25th 1999, Pavilion of Knowledge is integrated in the Live Science Network. 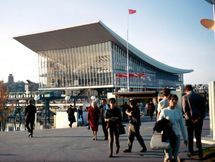 During the World Exhibit Expo’98 in Lisbon is located by the river Tagus. 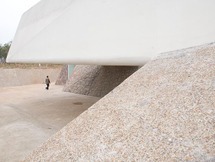 This was the Pavilion of Sea Knowledge, projected by architect Carrilho da Graça. This interactive science and.. The Jinhuan Architecture Park is made up of a series of 17 pavilions, designed and curated by Ai Weiwei in 2002. The architecture park is situated along the Yiwu River as a dedication to Weiwei’s father, the poet Ai Qing. 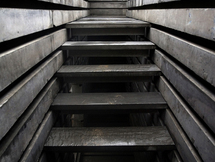 Ai Weiwei invited 16 architects from around the world to each design a.. 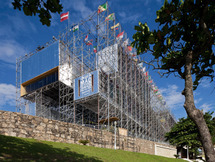 The Pavilion Humanidade was a temporary pavilion constructed for the Rio+20 exhibition that was held in Rio de Janeiro in 2012. The structure is made up of building scaffolding creating a translucent frame that was exposed to all weather conditions – light, heat, rain, sounds from the sea and..
To the linear and chronological time ‘CHRONOS’ opposes ‘KAIROS’, an undefined and symbolic time which cannot be measured except by his quality. The building wants to put two apparently irreconcilable times in dialogue. Since the very ancient periods buildings aspire to the idea of the ‘eternal’.. 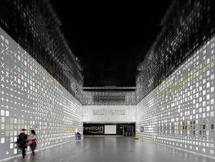 The manifestation of this message was largely molded in the diagonals and "free" geometric interruptions that Goeritz imposed to this building –Museo Experimental El Eco”-, opposing the rational grids that dominated at.. 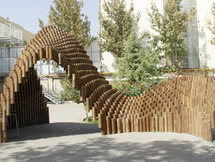 The Khayam University PIPE pavilion was constructed by architecture students under the direction and supervision of Farnaz Fattahi. This temporary pavilion explores the interaction of conceptual design thinking and the use of.. 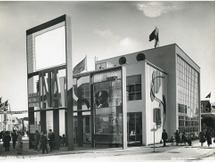 The Pavilion of INA (Istituto Nazionale Assicurazioni) at the Milan Fair was designed by Franco Albini and built in 1935. 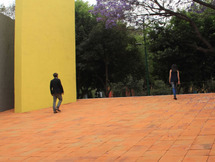 In this pavilion Albini presents the use of architecture as expression and communication with the public. 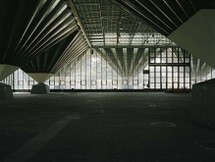 The building was a study on modularity and compatibility of.. 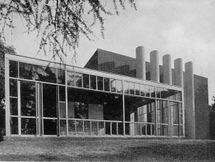 The Pavilion of the press in the Triennial of Milan 5th held in 1933 was designed by Luciano Baldessari and demolished in 1944. Baldessari resolve the contrast between massing and materiality, between modernity and tradition in a harmonious relationship and firmly established geometric rules. An.. 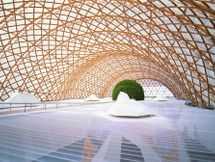 The Japanese pavilion for Expo 2000 in Hanover was designed by Shigeru Ban in collaboration with Frei Otto and Buro Hapold. The main theme of the Expo in Hanover was the environment and the basic concept of the Japan Pavilion was to create a structure that would produce the least possible..
Woman's Building at the World's Columbian Exposition in 1892 was designed by Sophia Hayden Bennett when she was just 21. 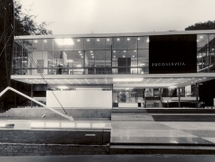 The Woman's Building was the nation's most prominent design competition for women at that time. Bennett based her design on her thesis project, "Renaissance Museum of Fine.. The pavilion of Yugoslavia was designed by the architect Vjenčeslav Richter, who originally proposed to suspend the whole structure from a giant cable-stayed mast. When that proved too difficult, Richter devised a tension column consisting of six steel arches supported by a pre-stressed cable,.. The 2016 pavilion designed by Studio Mumbai is a 12 meter-high structure conceived as a large gathering space and ideally aimed to connect ground, sky, and earth. 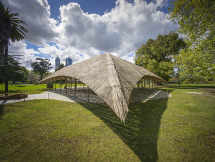 The structure is made of bamboo, assembled by using traditional, orally-transmitted Indian techniques. It is composed of a basic..